When my new baby Haden was born, I thought I was totally prepared to entertain my two-year-old Cooper. 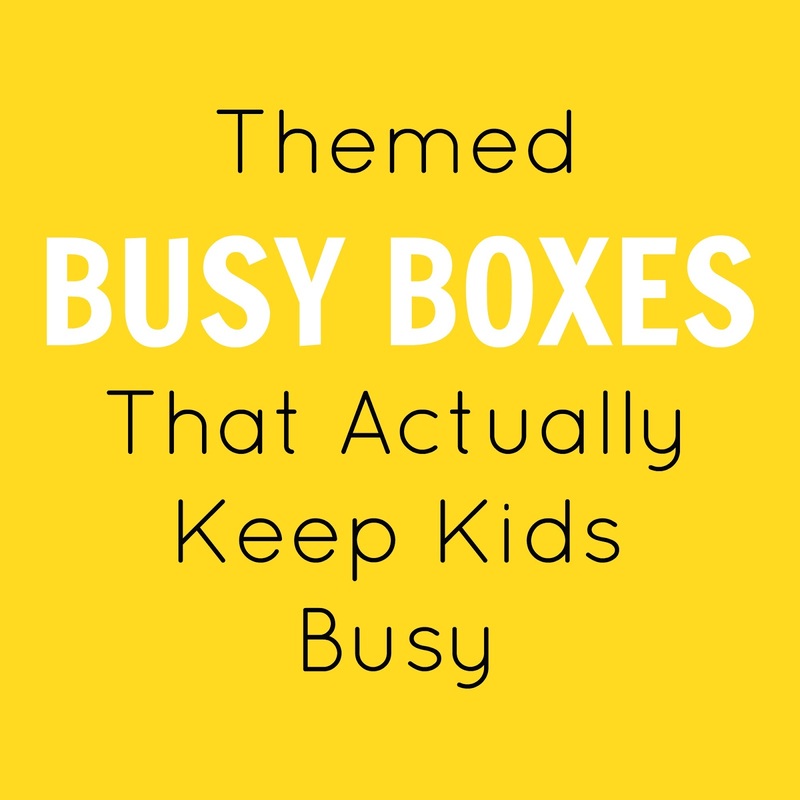 I had collected a bunch of toys, puzzles, and books to put aside into these “busy boxes” I had read so much about. I thought for sure they would keep him entertained while I nursed so I could focus on the baby. They worked.. but only for about 5 minutes. What I had planned on being two weeks worth of rotating entertainment, ended up being two days worth. I never had time to put the toys back into their designated boxes and so after about two weeks, all the special toys set aside were in a big pile on Haden’s floor, and Cooper was watching show after show on our Ipad every time I nursed. One sunday when we were visiting family, Cooper found a tea set at Grandma’s and went around for about 30 minutes straight making meals and “feeding” everyone. It was super entertaining to watch, and mind blowing for me to see that he could be entertained with one object for so long. That was when I had this idea for my busy boxes! Why not make them themed, and focused more on pretend play?! It totally did the trick! Now I set out three busy boxes at a time. If it’s a new box I explain to him what’s in them and show him a little bit about what he can do with them. He loves it! Because they are themed it also makes it really easy for me to clean them up but keep them organized. I just throw all the doctor stuff in a bin, the cars, etc. 1. Doctor: I got this doctor kit off amazon, and also found a few fun things around the house. 2. Cars: I pretty much always put this box out, but gather different cars that he has to put in it each week. 3. Tools: I just have to make sure I stress not to hit the baby over and over! 4. Dinosaurs: This is definitely not a quiet box! 5. Cook: He makes me and the baby delicious meals! 6. Firefighter: This is probably his favorite. 8. Music: Again, not a quiet box! 9. Balls: Sometimes he also gives me a bat and throws them at me. It’s super cute and surprisingly doable while nursing. 10. Puzzles: I can’t lie, I only set this out when I have the patience to step on tiny little pieces all day. 11. Cleaning: He loves this one! He does still get plenty of Ipad time even with these boxes, especially when mom needs some piece and quiet, but these have made a world of difference! Some of them are a bit bare, but I think it’ll be exciting for him as I continuously add more stuff. If you have any other ideas please share!! Keeping my toddler entertained sometimes feels like a full time job. Thanks for these busy box ideas. We have a couple that are similar, but I bet my toddler would cleaning and making music.